A view of the city of Allahabad on the banks of the Ganga river. P.S. - There will probably be a long gap before my next post as I fly off to Melbourne tonight and will, yet again, be computerless. u make me see more and more colours everytime! Oh and welcome back to Australia! :) Now get ur Mac soooon!! where did u take it from? 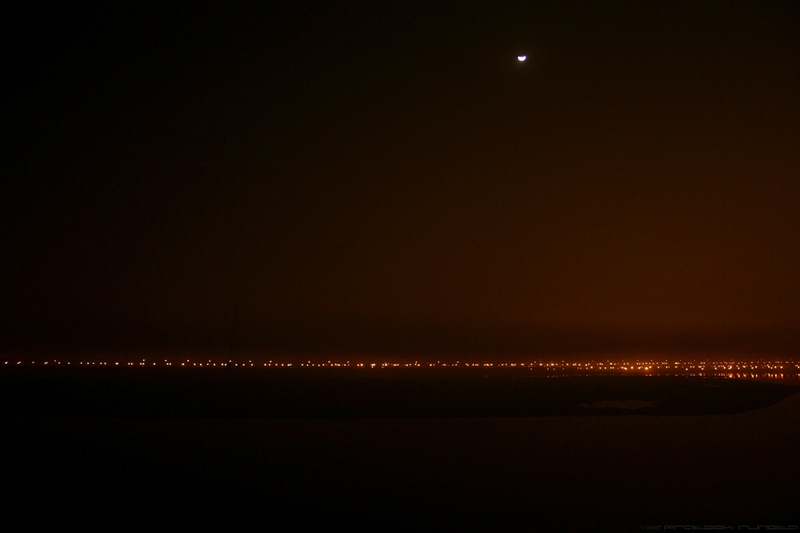 oye u know what....i think i can see the bridge (to my left) over Ganga...could u see it while clicking?? @Nag: I took it from a balcony of the place where we were staying at Allahabad. @Sourima: Nopes the bridge is not visible in the above picture. It was towards the right and not left. @Anchal: Let's hope that's the case! Yeah, even I find it difficult to say anything because everyone has already said the same thing I want to say. What happened to the plan of buying a MacBook Pro with Core 2 Duo? If you're waiting for the Core Quadro then you'll have to be computer-less for a longer time. @Abhishek: Lol. I'm not waiting for Quadro or anything and if everything goes as planned I'll have a MBP with me pretty soon. Yeah. So the "long gap" no more. the moon sure is enjoying its solitude far far away from that stretching strip of human settlement!